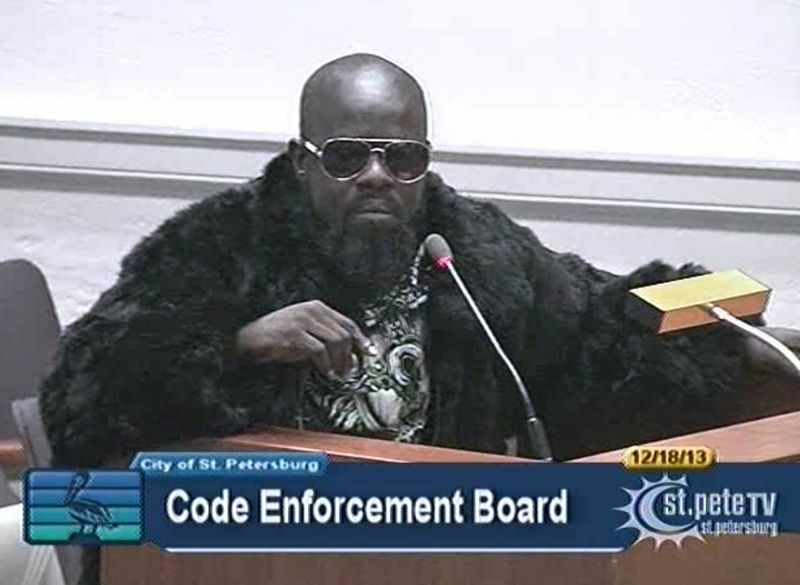 I am taking a break from coding (because one of my meds is giving me very painful migraines) and instead of watching a funny movie or exciting TV show, I found myself transfixed on month-old recorded videos of the local "Code Enforcement Board" proceedings on St. Pete TV. The mission of the Codes Compliance Assistance Department of St. Petersburg is to maintain the quality and extend the life of existing housing, to stabilize neighborhoods and to protect the public. As I understand, the Code Enforcement Board rules on violations of building codes and gives fines when the violations are not rectified in the allotted time. Word for word, the above paragraph qualifies as the top candidate for the most boring thing I have ever written on my 'blog and I've written some seriously bland material on the housing-bubble and financial crisis. Yet here I sit, completely captivated by video of a board room with seven administrators, hearing one case of violation after another. For each case, a code enforcement officer takes the stand under oath and reads out a case number, name of the accused, and the violations. The violations are everything from shattered windows and broken fences to operating unlicensed restaurants in residential zones. What impressed me was that everyone from the enforcement officers and board members right down to the accused homeowners were so rational, logical, and frank. Unlike the fake TV judges with over the top stories about domestic skirmishes, this is real life and even though no major crimes are committed, there is so much at stake for the homeowners and community. And unlike courtroom cases where there is a lot of he-said-she-said interpersonal conflict and drama, homeowners end up facing the Code Enforcement Board when for some reason or other, they fail to take care of property, paperwork, and procedures. In simpler terms, instead of resolving playground fights, this is the grownup version of why Johnny didn't do his homework. In one instance, a homeowner did not take care of a fallen tree that was partially blocking the road. One of the neighbors filed a complaint with the city, and rightly so. The city did an investigation and sent a notice to the homeowner, giving him a month to fix it - a pretty fair action. The homeowner ends up in the board room because he did not take care of the tree after a month. Now we hear his side of the story. He said a large section of the tree was touching live electric cables. The electric company was scheduled to take care of that but they haven't. The board then unanimously gave him another 60 days to take care of the tree, more than enough time to resolve the issue with the electric company. While this sounds fairly routine, the homeowner sounded pretty frustrated because all of this was beyond his control. He didn't cause the tree to fall, he cannot clear it because it is touching electric cables, he had a hard time getting in touch with the electric company, and here he was, being dragged into board room on a regular work day. Unlike the hundred "This can happen to you!!!" stories we hear about in the media, this is the one that can most likely happen to me. And it is hard to find someone to blame in this. The electric company probably has thousands of such cases to deal with after every thunderstorm, the neighbors don't want to hit the tree while driving, the homeowner isn't going to risk getting electrocuted cutting the tree himself. The city officers did the right thing in investigating it and the board did the right thing in extending the period. While I have no background information on the board members, each of them who asked a question or made a statement, did it politely, clearly, and without any prejudice. This is not some all-powerful "board" who's judging the poor citizenry. This is just regular people making rational decisions and hard choices for the good of the community. However, sometimes you do feel bad for the accused. This guy (actual screenshot below) was being charged with operating an unlicensed barbeque grill in a commercial zone. Come on guys! Let the man cook in peace!